There are ups and downs - life always shows you both sides. When you think you're at the highest point, is when you go down," KP Aravind says. He's talking about life lessons that a decade in motorsport have taught him. But it seems like a metaphor for the Dakar itself. My mind immediately turns to images of undulating sand dunes, and rocky trails that go up steep inclines and right back down again. And of course, in my mind's eye, as is likely in the actual Dakar, there's a motorcycle flying over the mixed terrain. KP Aravind (41) and CS Santosh (48) are India's two hopes at the Dakar 2018. And it seems like they're neck and neck! It's hard not to have images like this floating through one's head given that as we approach the 2018 edition of the Dakar, our hopes rest squarely on the shoulders of two Indian entities - the Sherco TVS Factory Rally Team and Hero MotoSports Team Rally. But perhaps slightly more importantly, our Dakar hopes rest on the shoulders of KP Aravind and CS Santosh. Two Indian riders from the south of the country. The former with one Dakar start under his belt. And the latter with three Dakar starts, and two Dakar finishes behind him. But this right now, is the moment of reckoning. This is when they have to prove themselves, if not to the world, then just to themselves. But the world certainly is watching. As are a bunch of Indian motorsport anoraks. And with thekeen amount of attention on both riders, comes perhaps a little bit of comparison? "No, not a little bit! There's comparison on every level," Aravind laughs. But he says that his first Dakar experience back in January 2017, that saw him retire on the third stage of the event, with a fractured hand and an injured shoulder, has taught him a thing or two. "I think the first Dakar experience has taught me that I shouldn't compete with anyone, I should just be the best version of myself, and not let anything bother me," he says. It's a philosophy that he's adopted over the course of the entire season of cross country rallying this year. And it's helped him immensely. The results began to come in - steady performances, consistent days in the saddle, and strong finishes. Culminating in a 15th position for him at the Oilibya Rally of Morocco. 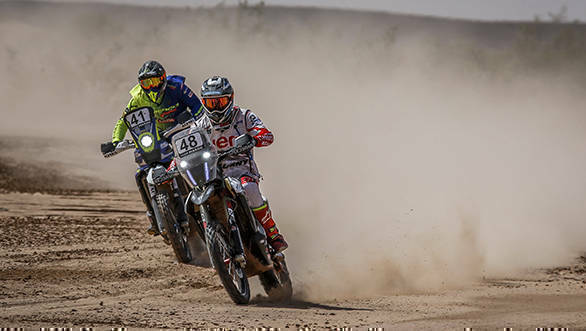 CS Santosh finished two spots ahead, with 13th position at the event, their last competitive outing before the Dakar Rally. Both have proved a point. "I think this year, me and KP, we opened a lot of people's eyes," Santosh says. "I mean finishing 13th and 15th, that's no small feat." For, amidst all the admiration and adulation that has been showered on both riders, there's been a small section of people who have dismissed their achievements. People who've said that the two only managed to land their seats with Hero and with TVS, because both Indian motorcycle manufacturers felt pressured to put Indian riders in the saddle. "I understand where I come from, I am an Indian, and sure Hero is an Indian company and they need to put an Indian pilot there for various reasons," Santosh says, "But this year I think I've earned my place," he continues. The Hero Motosports rider doesn't shyaway from talking about just how good friend and rival KP Aravind is proving to be. "That guy is fast this year!" Santosh says. "I saw him ride in Morocco, and that guy is really fast in the dunes," he repeats, with the emphasis on the really. Santosh tells me he's had a few conversations with Aravind, and he's learned a good deal from him too, having managed to get a lesson here and there about things that he'd overlooked himself. "Of course I compete with him, and I want to beat him, and all of those things, right. But that's in the back end," he remarks. "But I also see the guy, and you have to tip your hat [off to him], because I understand the risks that we have to take to go fast while rallying," he says. It goes without saying, that in order to compete in a rally like the Dakar, one needs to be able to take risks. Massive risks. But risks, and the willingness to take them, form just one side of Dakar's rapidly spinning coin. The other side of it, involves amounts of preparation in order to make sure that one is Dakar ready. CS Santosh isn't always quite so grim, we assure you. He's even more chipper now that he's getting used to the new RR 450 that he'll pilot at the 2018 Dakar. 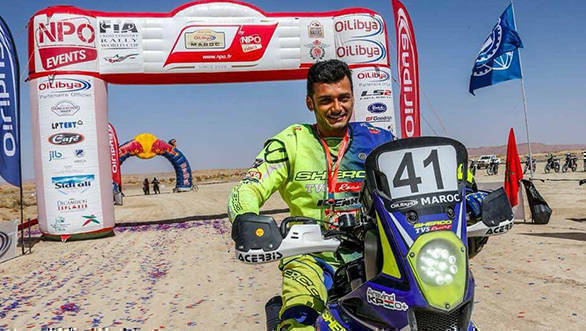 Aravind says of his first attempt at the Dakar "I wouldn't back down from agreeing that I was unprepared for the event. But the Dakar is the Dakar! How much ever you prepare, you're not really prepared," he says. Which means that after his first experience at the event, he's tried to learn as much as possible, in a very short period of time. And the learning began right after his crash. 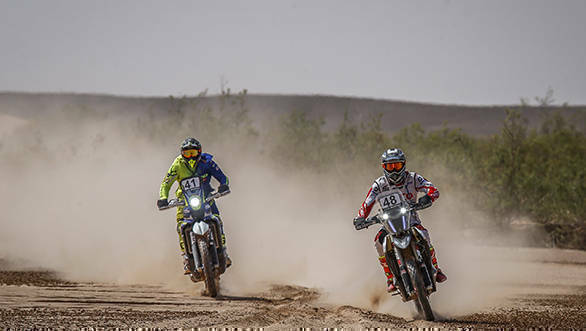 He followed the rest of the Dakar, moving from bivouac to bivouac, with the Sherco TVS team, and trying to understand how his team-mates - Frenchman Adrien Metge and Spaniard Juan Pedrero Garcia - approached the event. That's since been supplemented by regular training on the bike and off it, in order to ensure that his second attempt at the Dakar will be a lot better than the first. Santosh, who is set to tackle Dakar No. 4, thinks back to his first Dakar back in 2015, when he competed as a privateer. In retrospect, he thinks he was in over his head. He's come a long way since then! "This is the most prepared that I have been. If I have to think of all the years that I did the Dakar I couldn't even imagine how I did the Dakar, the way I did it, with the preparation that I had. It's surprising sometimes," he laughs. "But I guess this is the most prepared that I have been, so I am happy with that," he continues. And it's rigorous training schedules that have got them to this level of preparedness. 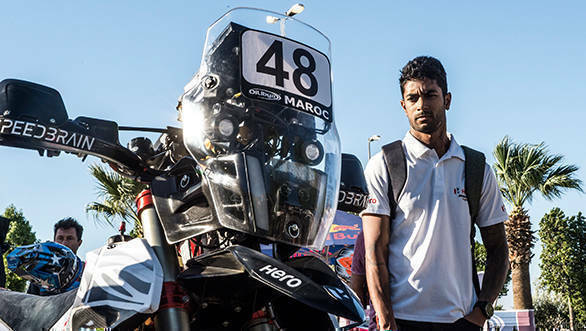 Aravind talks about how his training regimen has been amped up at present, but as the Dakar approaches, it will taper off. 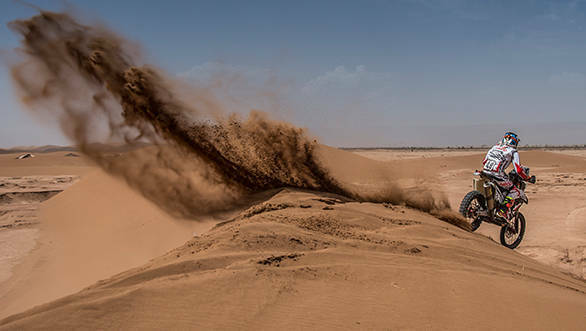 "As the event approaches you go into rest mode, so that you preserve yourself well and you're energised to go to the Dakar full power," he says. Right now though, he's mixing things up with high intensity interval training three times a week, a little cycling here and there, some boxing, squash and badminton too. He says he likes a variety of exercises so that he can avoid getting bored. But every now and again, he sits himself down and rests his mind. Goals cannot be achieved, he says, unless one manages to "motivate your thoughts and energise your thoughts of being the best." Both CS Santosh and KP Aravind aren't bothered by the comparisons being drawn between them on every level. Each rider insists that the goal is to go and enjoy the ride. I'll spend more time on the motorcycle," he says to me. A couple of days after the interview, and his social media feed is already full of him training on his motorcycle in Spain. As he puts it, the gym is merely the backend office. "Ultimately the skills that really matter are the skills on the motorcycle," he says. Santosh has also worked on mental training in order to help him come to terms with the all-important roadbook, which he's struggled with in the past. It's a combination of various puzzles and games, some of which he even plays on his phone, that have helped sharpen his mental skills in order to make sure that he processes his roadbook faster. It seems to be working - not only has he started to read the roadbook better, he's also begun to trust the roadbook, which really is important. When you're in the middle of nowhere, with nothing but sand dunes as far as the eye can see, in a world devoid of Siri and Alexa, the roadbook is your only friend. I didn't expect to find myself in that place," Santosh says. But he's realised that "it happens when you have consistent days, and don't make a lot of mistakes. It's possible!" Hero MotoSport Team Rally's hopes also rest on Joaquim 'JRod' Rodrigues' shoulders. Here he is tackling the dunes in Morocco. Some pressure also falls on the team's newcomer - Oriol Mena. Aravind seems to have had a much steeper learning curve, compressing all of his lessons into a much shorter time frame. I ask whether he thinks he's a fast learner. "Well, I wouldn't disagree with you!" he says laughing. Some of it has come easily to him. "I am blessed with a good memory. I am blessed with good brains," he says. It's helped, he adds, that he's also been "blessed with a good team, who help me learn what I need to learn, and help me concentrate and focus on what is important in rallying." What's also helped is the fact that he's passionate about the sport that he competes in. "If you want to learn something really badly it kinda gets to you," he says. Aravind is quick to clarify that the results don't just show up out of the blue. "Every day is challenging. Every roadbook is challenging. It's not that I go there, cruise and come to that position," he says, stating that it was "very, very hard initially". Now, however, things have become easier. But there's some learning to be done every single day. "The nature of the rally is such that they will not let you be comfortable on any day," he says. "So there is a lot of learning every day that you have to do. You have to implement what you learn, and cope with new things, and get better every day." Both riders have also had to come to terms with new motorcycles. In the case of Sherco TVS, the new Dakar motorcycle isn't a ground up change. "It's an evolution of the last Dakar bike," Aravind clarifies. And you can read more about the bike elsewhere in the issue, because OD's own Abhay Verma had a go riding it. "We've done a lot of testing on the suspension, and we're at a good stage," Aravind says. Changes to the motor mean that it makes more power, and goes faster too. The new exhaust helps the bike "breathe better and sustain better," Aravind says. But most important of all "The bike really suits my riding style," he declares. Over at the Hero camp, there's been plenty of change, with everything, other than the engine, being all new. Santosh says the new bike is more agile, safer, lighter, easier to work on. "It gives me a lot of confidence to be able to ride the motorcycle and it makes my job easier, because I don't have to be afraid of the motorcycle and what it's going to do, because it's so much more predictable," he says. One of the biggest changes is the fact that the weight distribution is now very centralised, which means the motorcycle now has a lower centre of gravity. "That itself is a huge thing, because at the Dakar, and at any rally, most of the weight comes from the fuel that we carry. So if we have that in a good place, it's a huge change for me." So, there you have it. Two riders, two different approaches to learning. 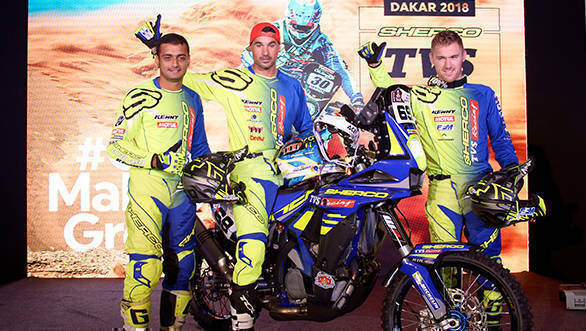 But both Santosh and Aravind have similar goals and aspirations ahead of the Dakar. "Finishing is my victory," Aravind says. "Finishing, is like finishing first to me!" It shows an incredible amount of maturity and growth from someone who is, by his own admission, naturally competitive. After all, he's already decided that the only competition that he has at the Dakar is himself. "My competition is myself. If I am better tomorrow, from today, I'd say it's good for me," the rider from Mangalore declares. Meanwhile, Bangalore's Santosh says, "I realised that if you have goals and expectations, you just set yourself up to be miserable. So my only goal and expectation in life is to just enjoy the moments that I have." But surely he can't go into the Dakar with absolutely no goals. Santosh clarifies "If I can do well on the first day, I'll be happy. Then if I can make it to the second day and do well on the second day, it's great for me. And we'll just go with that." Aravind tells me that he "has zero pressure, and no point to prove to anybody." Instead, "My team just wants me to have fun, and that's what my primary goal is also. I just want to get to the finish line every day. And have fun on the bike!" Santosh echoes the same thing, but helps me understand why having fun on the bike, is more important than the result itself. "Because at the end of the day, that moment when you achieve a result is really small, but the process of doing it is what you really need to enjoy." Onward to Dakar 2018, then. Try and come out of it smiling!